The trees at the back are ficus Hillii and the Bamboo is slender weaver clumping bamboo. Has this client experienced problems with roots affecting fence? - I love this look and it should grow well in our small Brisbane garden. However, I read that this Ficus has a strong invasive root system. I love the look but don't want to risk it pushing over our wooden fence. Ficus tree variety - Guys what variety of Ficus are they? Standard or flash? Love the design and colour scheme. What are pavers and coping? Pruning - To achieve the long trunk to the base of this photo is this a pruning method or a type of Ficus? These trees have been pruned to look like this and are the work of Nathan Burkett Landscape design. Bamboo near the pool - Hello, I love this outdoor, it's so refreshing! Can you tell me, is the bamboo near the pool annoying or creating mess in the pool? We love this look but haven't idea which plants lose leaves and which don't?? Unfortunately Bamboo doesn't change its nasty little habit of shedding when it is next to a pool. We planted Slender Weaver Bamboo which grows tall and slender and has a non invasive root system. Fills in the space quickly, adds a hedge and isalways green, Certain Clients are happy to live with a bit of shedding but it is your choice. Thanks for the advice.....not sure what to do now but it looks beautiful nevertheless! What pool tiles have been used? thanks a million. do you know the tile brand/model number? cotto? The Bamboo here is slender weaver but you would need to consult a Landscape Gardner , Architect or nursery for that information as we are builders and the Landscaping was provided by Nathan Burkett Landscape Architects. What is the fence you used? Hi There Thank you for your question. The landscaping was done by Nathan Burkett Landscape Architects Perhaps sit would be best to consult their firm regarding the underplanting. Again, you would need to consult a Landscape Gardner , Architect or nursery for that information as we are builders , not gardners and the Landscaping was provided by Nathan Burkett Landscape Architects. Trees beside pool - Do they have invasive roots like other ficus? 8. Use pleached trees or tall, thin plants Pleached trees (where the foliage is trimmed to form a hedge) are ideal for small gardens as they let in light above and allow space for planting below. The pleached trees used here are the lush and dense Ficus microcarpa ‘Hillii‘. To their right is a planting of bamboo, ideal for narrow areas due to its tall, thin form. See how the lovely light grey trunks of the ficus echo the straight culms of the bamboo. Plants can be trained to suit the location. This photograph shows how pleaching fig trees help to keep their growth under control while the raised canopy is very uniform. The light coloured trunks are accentuated to create nice geometric lines to suit the sophisticated, linear pool. TIP: Be mindful of your plant choices when hedging around pools. Deciduous plants can spell disaster as can many other trees and shrubs that drop leaves regularly. If you have children that are likely to splash a lot you’ll need very tough, chlorine or salt tolerant plant choices to ensure survival. 1. Clean and green In this tranquil Melbourne backyard, a combination of fig trees (Ficus microcarpa var. hillii), clumping slender weaver’s bamboo (Bambusa textilis var. gracilis) and a low-growing ground cover looks effortlessly chic. 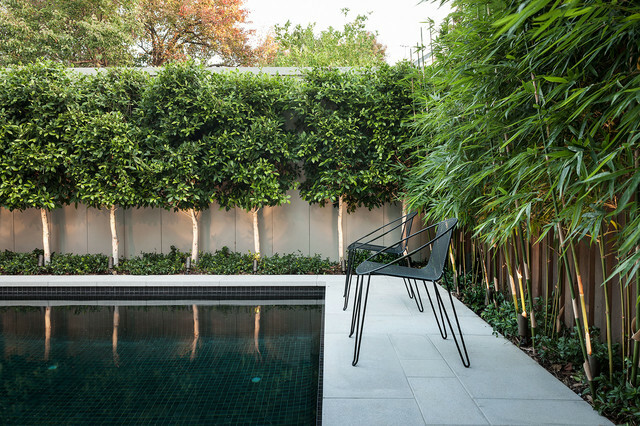 To get a similar look, choose poolside plantings with interesting forms and foliage, saving colourful flowers for other areas of the garden.Ficus offers the advantage of having little leaf-drop and filling in quickly to provide dense coverage – useful for creating privacy around a pool or covering a fence with green. Like all bamboos, slender weaver’s does exhibit some leaf-drop, but the designer has cleverly set it back from the pool for easy sweep up.